All the best-known Bible stories are retold in this delightful storybook - Noah's Ark, David and Goliath, Jonah, and the miracles of Jesus. Paola Grudina's lively, humorous illustrations are the perfect complement to Jan Godfrey's engaging narrative. About "My Story Bible (Previous Title: The Young Story Bible)"
Jan Godfrey is an experienced writer for children under 7 years old, with many published books to her name. She was formerly a schoolteacher and has recently retired to Dorset in the south of England with her husband, who is a Church of England clergyman. She has four children and many grandchildren and has always loved to tell stories. Paola Bertolini Grudina is a graphic designer and children's book illustrator whose inspiration comes from her own Christian faith. She lives with her husband and five children in Gorizia, Italy, on the border with Slovenia. 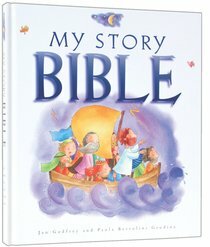 Customer Reviews For "My Story Bible (Previous Title: The Young Story Bible)"
The story is told based on scripture with the scripture reference at the back. Very nice pictures and illustration. I just purchased this for my children and have promptly turfed it. The illustrations are fantastic and the words read well when flicking through at the store. I was pleased to see it dealt with stories beyond Pentecost where our previous childrens' "bible" had stopped. Imagine my surprise when we opened at home for the first time and read the first story of Creation. There was no Fall from Grace. No introduction of sin with Adam and Eve. God simply made a world that was good and then Noah suddenly needed to build an Ark. I fail to see any point in a "bible" which really is all about Salvation in Christ Jesus when we apparently had no fall from grace in the first place. I am sorry but it is too crucial a story to omit. It never occurred to me to check that it was included in the first place. We didn't bother with the rest of it but got rid of it and are now in search of something more true to the basic gospel message.